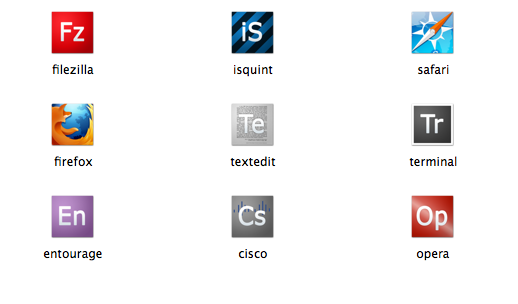 I found a nice free program called img2icns for Mac to turn them into icons. You can use Converticon.com for Windows. I also made a template for creating Adobe CS3 style icons based on a .psd from pshero, so if you want to make your own you can download my template. When creating a website being able to insure that it will look right for everyone can be a real hassle! The next best thing to having every version of every browser and OS available for testing is being able to get snapshots of what the site looks like in those browsers. A few caveats are that the snapshots don’t tell you if your interactive elements are working, they’re just images so you can’t test out any features for them. Your website also needs to be hosted online in order to get screen shots. Browsershots has the best selection of browsers out of the three, but it’s free service can take hours to render a screen shot, and parts of the screen shot can be blocked by error messages. It does offer premium services, but at $30 a month I don’t think I would use it enough. Netrenderer is great for IE, but it only does IE. And if there’s to much traffic you are not getting your screen shot. period. Adobe Browser Lab is really fast, and unlike the others it offers much longer screenshots. It doesn’t have as a wide a variety of browsers as browsershots, but does offer other features like onion skins and side by side comparisons. For now they’re offing this service for free for one year, and after that it’s $20 a month. For the cheaper price and extra features I would choose the Browser lab over premium Browsershots. I would like to see a few more browsers here, but it does cover the majority of the market. That $20 does include a few other services – but nothing I would actually use. Although, they may add more later so it could become quite worthwhile in the future.